By Anusa : 588 Words: Machine is a device which performs human activities very efficiently and effectively. So 'time machines' may be explained as device which can take us in the existence of past , present and future. Alternatively we can say that a time machine is a machine which is capable of transporting a person backward or forward in time. Using a time machine we can see the past time i.e. the early days and also we can see the future times. Before writing about my invention I would like to focus the idea of time machine with the help of the two most popular Japanese Cartoon series ; which are very interesting and most famous amongst the children. Similarly there is a cartoon series which may you will be familiar too of Doraemon and Kiterestu. I would like to write this essay by giving examples. 1st example: Doraemon is Japanese manga (a Japanese genre of cartoons having a fantasy theme) series created by Fujiko Fujio which was first appeared in December 1969 . The series is about a robotic cat named Doraemon who travels back in time with the help of time machine from the 22nd century to help a pre-teen boy named Nobita Nobi. Nobita experiences nothing but misery and misfortunate for sometimes for his life, family and his future. So always he insists Doraemon to help him by seeing his future or sometimes past to know about him, his parents and his friends with the help of time machine. He is jealous of some of his friends like Dekisugi because he is good in studies and score good marks. For this he uses time machine to know about his future scores of examination. 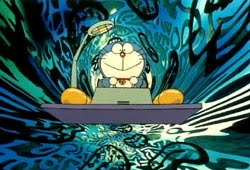 Doraemon has to travel through time and it has to drive its time machine at full speed to make it work. The time machine of Doraemon is in Nobita’s desk drawer. It is a simple platform with a control and a clock to set time in it. 2nd example: Kiterestu Daihyakka is a science fiction manga also created by Fujiko Fujio which was first introduced in children’s magazine Kodomo no Hikari from April 1974 through July 1977 and was finally made into cartoon animation. He frequently travels in time with his friends, Miyoko and his robot Korosuke in the time machine which he invented by himself. The time machine is made up of wood like a bench covered from all sides and with a controller to maintain the time. He uses time machine initially for new invention because it is his hobby. If I would invent a time machine with any physical appearance then I would also like to travel in time. But except these fantasy I will program the time machine to control my house activities. For example the electric switches automatic operation , closing the water taps, shutting the doors, attending the phone calls and reminding me about my study plan. I will also check my future success by travelling in future. I will use it to make society happy and try to help my poor friends with the help of time machines. It is all about imagination which comes in mind of many children. I will be excited or aggressive to know especially of my ancestors to know about that time, their lifestyles, the way of living, culture, tradition etc because history is one of my most interesting hobby. Also like Nobita to know my future I would like to travel in future time to see the changes, sophistication of machines and the difficulties of human beings regarding water, air, global warming etc in time to come. Time machine is nothing but a device of human imagination which may be turned in reality.